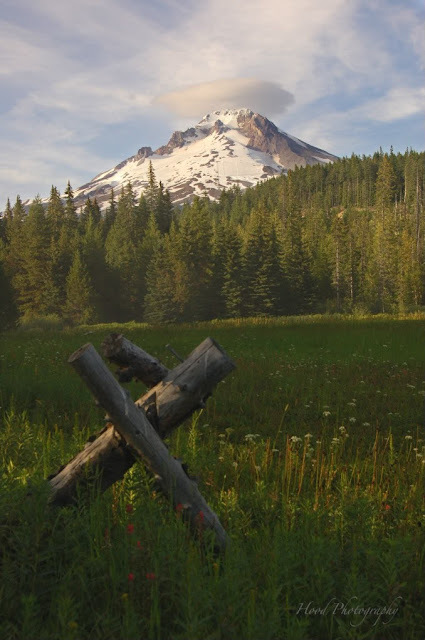 At 11,235 ft, Mt Hood is Oregon's highest peak. In this photo, you can see the beginnings of the famous cloud cap that forms over its summit, also known as Hood's Hood. The meadow in the foreground is Summit Meadow, and was home to many pioneers making their way west. It became a tollgate from 1866-1870. WOW... What a beautiful picture. Love it. I'm getting a nosebleed already! Now I am singing U2, but with your beautiful view, I can handle it. great shot. I'd love to take a metal detector across that meadow! I'm sure there are some amazing 'treasures' left behind by the pioneers. Do we need to acclimatize? That's gorgeous! I love those flying saucer clouds that form at that elevation! I saw some over Mt. Shasta last May. Really like the perspective on this photo. This would make a fun jigsaw puzzle. This is beautiful, it looks like a painting! I saw a small lenticular cloud sitting on top of a cone of puffy clouds the other day and my eyes tricked me into thinking I was looking at Mt. Rainier. That's the 2nd time it's happened since I've moved to the Cape. Fabulous photo! The little shaft of light across the meadow really adds depth to the photo and the mountain is out in all her glory. Beautiful! Great photo and good word for E. I think those three mountains, Ranier, Hood and Baker rising out of nowhere are spectacular. Beautiful shot. The composition works so well. just wow. the view is simply breath-taking. nice composition.